– Increase revenue & product penetrations through retail channels by executing effective sales campaigns to achieve sales & revenue targets set by the Management. – Improve retail brand visibility by using updated marketing materials is order to create awareness through brand availability in customer & retailer mind. – Monitor and manage partners, sub dealers, distributors and channel partners effectively to maintain 200% availability of products and services through them. – Regular route visits, promotions, market audits and understanding market behaviors to develop and increase relationships in assigned territory. – Assist and develop the staff at touch points and alternative partners for excellent customer experiences and increase cross sell and up sell revenues. 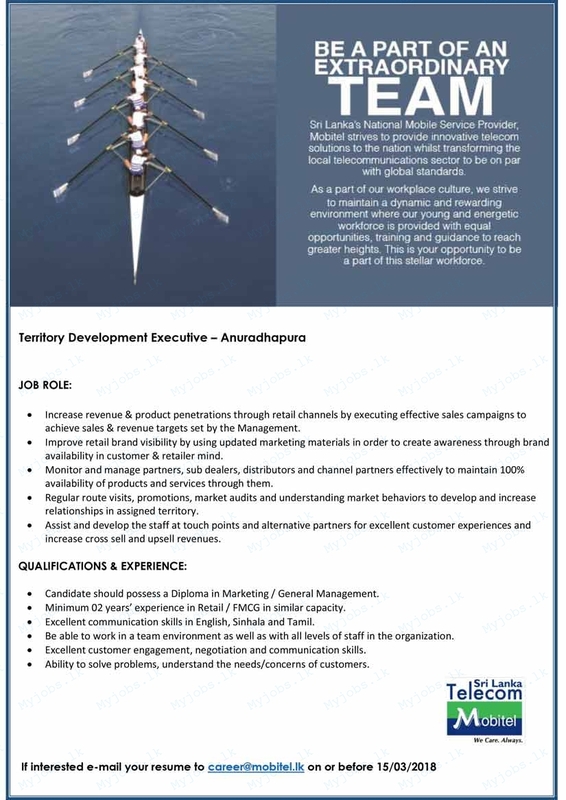 – Candidate should possess a Diploma in Marketing / General Management. – Minimum 02 years’ experience in Retail/FMCG in similar capacity. – Excellent communication skills in English, Sinhala and Tamil. – Be able to work in a team environment as well as with as with all levels of staff in the organization. – Excellent customer engagement, negotiation and communication skills. – Ability to solve problems, understand the needs/concerns of customers.